Click here to see an alphabetical list of BNI Hunter Valley chapters. 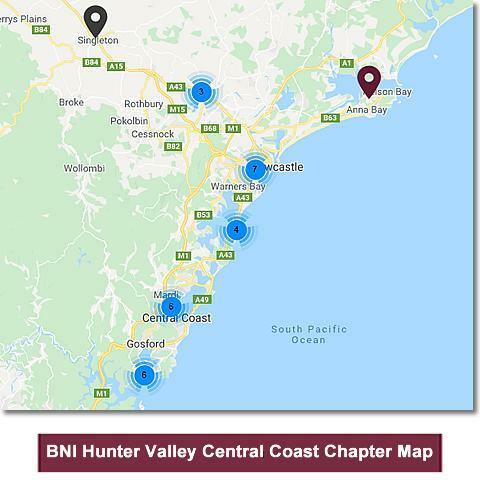 See the map below for an overview of BNI Hunter Valley and Central Coast chapters. To search for a city or town, enter the area e.g. Newcastle, NSW. Click here to conduct an "Advanced Search" to locate a specific BNI Hunter Valley and Central Coast chapter. You may also call 0419 233 067 or click here to send an email to visit a chapter. Click here to see the chapters currently forming in the BNI Hunter Valley and Central Coast region. If you are interested in starting a new chapter please call Kristan and Robert Hartup, Executive Directors BNI Hunter Valley at 0419 233 067.